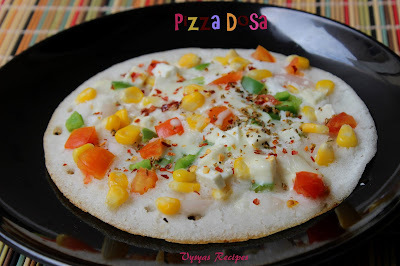 Pizza Dosa is an Colourful & yummy dosa Recipe made with Idli Dosa batter & some Colourful toppings of your choice. I used Onion,tomato,Capsicum,corn,Paneer & cheese as Toppings, with sprinkles of Chilli flakes & oregano. 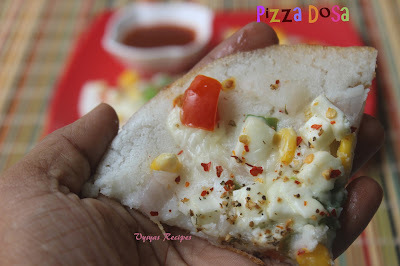 if you have craving of pizza, using the batter you can make this dosa in ziffy. 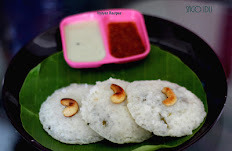 it is a kids friendly recipe. kids love a lot. 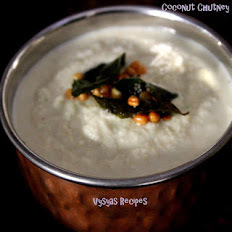 Dosa batter - 1 cup. tomato sauce - for side. sweet corn - 2 tbsp. 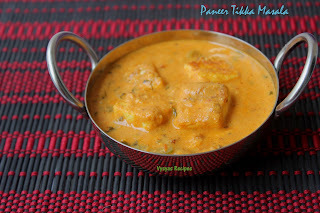 paneer - 10 small pieces. chilli flakes - 1/4 tsp. 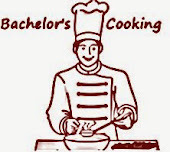 If frozen corn use it as such, else cook the corn. 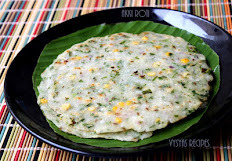 Consistency of dosa batter should be, little thicker than normal dosa batter consistency. Heat the tawa,when tawa is hot, add ladle full of batter,then add one more ladle on top of it. Don't spread the dosa, batter will automatically spread. if you want crust at the edges, just spread the dosa little. Then drizzle the oil. Now change the flame to medium low. 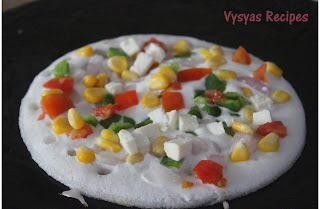 Sprinkle the chopped veggies,sweet corn & paneer on top of the dosa. When 3/4 of veggies are cooked, top it with grated cheese. Cook it covered. When cheese melts, sprinkle oregano & chilli flakes. Remove from tawa . Cut the pizza into wedges using the pizza cutter or knife. Then place it in a serving plate, & serve with tomato sauce. if you want base of dosa to be thick, don't spread the dosa, it spreads by itself. 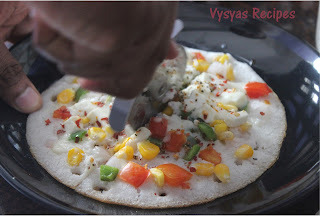 if you want crust at the edges just spread the dosa a little.if you want thin crust pizza dosa, make the dosa thin.Spreading the dosa entirely depends upon your preference. I used tomato sauce as the sides. if you spread tomato sauce while making dosa, dosa becomes soggy. Adding toppings is based on your preference. you can also use potatoes,peas,carrots or mushrooms,but precook it before you top it. Add grated cheese when 3/4th of veggies are cooked, else if you add earlier veggies won't cook properly.